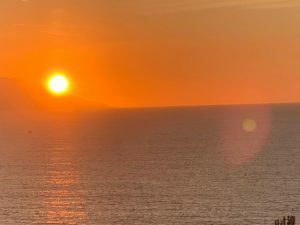 Winter in Puerto Vallarta brings incredible sunsets and we cannot deny it is one of our favorite pastimes to settle into a plastic chair on the beach, with a cold beverage to sip and watch the great ball of fire sink into the sea. People gather all along the malecón from one end to the other. There are multiple cafés on the long stretch, including those we favor on the south end where one can dig toes in the sand and relax. Many fine restaurants offer Happy Hour (Hora Feliz) at this time, though there is no need to promote the setting of the sun. There are few bargains we can recommend more highly with half price drinks and two-for-ones plus a show put on by Mother Nature that exceeds all expectations, on a daily basis. Once the sun dips down below the horizon, a green flash is visible for a fleeting second. Blink and you will surely miss it. Though there are the deniers, there is no doubt of the reality of the green flash and is scientifically verified. The green flash at sunset is an optical phenomenon that occurs only when conditions are perfect. Green flashes can also occur at sunrise. Sometimes, though it is rare, the flash will actually appear to be shooting out of the sun but that’s simply an illusion. This phenomenon occurs because the atmosphere causes the light from the sun to separate into different colors. A virtual rainbow is sometimes though seldom witnessed. A green flash can be seen at any altitude and we have been delighted to spot them on airplane rides that have flown parallel to the coastline. It is not unheard of to see a green flash over the top of a cloud and mountaintops, as well. Pilots witness them frequently when flying in westerly directions. We have been told, though personally unconfirmed, that the best place to see the green flash of a sunset is on the equator. When the sun has disappeared and the ocean has achieved a golden glow, picture taking opportunities go on for an amazing amount of time and it is tempting to continue taking photo after photo, capturing so many shades of orange, gold, yellow and magenta; it’s difficult to imagine an artist has such a palate. The applause and cheers that follow a sunset in Puerto Vallarta signal the commencement of another night of fun and lively entertainment, all along the beach and throughout the town.